Many people are choosing to say “I do” in a beautiful garden, surrounded by their nearest and dearest. Not only does it offer a natural and romantic setting, but the backdrop can also look stunning in wedding photographs, regardless of if the photographs are posed or candid. Whether you are a happy couple hoping to wed in the great outdoors, or you are considering offering outdoor ceremonies at your venue, find out how to host the perfect garden wedding. A couple can only marry in a venue that has been granted a full marriage licence by the local authority. What this means is that the engaged couple cannot legally marry in their back or front garden, but they can wed in a commercial garden that regularly hosts legal ceremonies. The family and friends attending the wedding will want to hear the ceremony from start to finish, so you must consider the acoustics when planning an outdoor wedding. Microphones and speakers are essential, as it will ensure the happy couple’s nearest and dearest will not miss them saying their vows. Of course, the garden will need to look beautiful on the big day, which is why you must ensure the grass is freshly mowed without patches, and the flowers and plant life are in full bloom. To ensure you create a beautiful space all year long, incorporate seasonal flowers into the garden so that different buds will bloom from spring to winter. Every garden needs a beautiful focal point that will wow guests. For example, a beautiful water feature can add a touch of luxury to the special day. Plus, the trickling sound of a stream or pond will create a calming, tranquil environment that will make guests fall in love with the setting. Find the perfect garden focal point by visiting Water Garden. 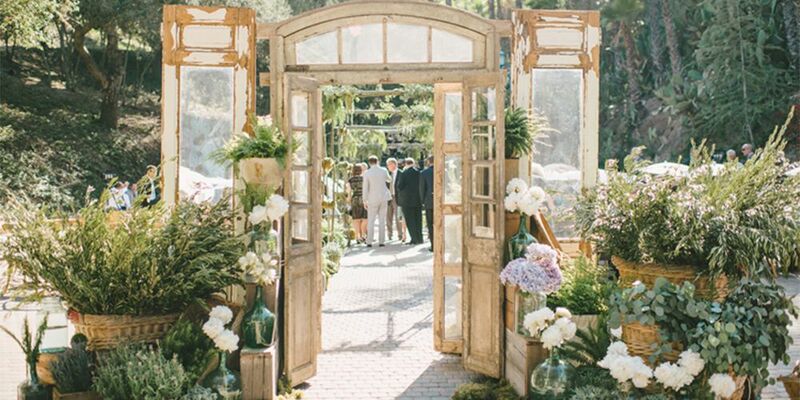 There are many things to think about when hosting a garden venue. Not only must you ensure there are enough seats for every guest, but you also must provide easily accessible toilets. Also, think about whether the venue provides sufficient parking for all wedding guests. Unfortunately, all sorts of pests might happily explore a garden that is filled with flowers and plants, which could bother the couple and the guests. Keep ants, bees and other insects at bay with a pre-event bug spray and by burning citronella candles. Otherwise, every guest will be longing to return to the safety of the indoors. Although a weather report might have stated clear skies and sunshine, it is possible you could experience strong winds or rain. That’s why it’s vital to have a plan B in place should the worst happen. For example, have another beautiful room ready and waiting should the weather take a turn for the worst, so the newlyweds, as well as their guests, can move inside for the ceremony. Copyright text 2017 by Fact Checked.